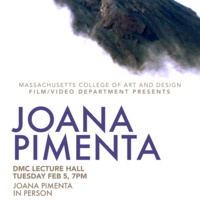 The MassArt Film/Video Screening Series: MassArt Ciné-Culture presents the work of filmmaker Joana Pimenta. The director will be present at the screening with an open discussion to follow. All are welcome to attend. Joana Pimenta is a filmmaker and writer from Portugal who lives and works in Lisbon, the U.S. and Brazil. Her latest film, An Aviation Field, premiered in the International Competition at the 69th Locarno Film Festival, was screened in the Toronto International Film Festival, New York Film Festival, Rotterdam International Film Festival, CPH:Dox, Rencontres Internationales Paris – Berlin, Valdivia, Lima, Mar del Plata, Edinburgh, among others, and received the Jury Award for Best Film in Competition at Zinebi ’58. Her previous work, The Figures Carved Into the Knife by the Sap of the Banana Trees, received the Jury Award for Best Film in Competition at Indielisboa and the Tom Berman Award at the Ann Arbor Film Festival, and was screened at the Toronto, New York, Jihlava, Taipei, VideoEx, and Syros film festivals, among many other venues. Her work in video installation was exhibited at the Festival Temps d’Images, National Art Gallery, Harvard Art Museums, Solar – Cinematic Art Gallery, Fundacion Botin, Galeria da Boavista, The Pipe Factory, and Casa Niemeyer, among others. As a cinematographer, she was the Director of Photography for the feature Once it was Brasília, which premiered in the 70th Locarno International Film Festival in 2017 where it received a Special Mention, and for which she received the award for Best Director of Photography at the 50th Festival of Brasília. She is currently co-directing two films with the Brazilian director Adirley Queirós, the short fiction film Rádio Coração and the feature fiction film Dry Ground Burning. Joana received a PhD in Film and Visual Studies and Critical Media Practice from the Department of Visual and Environmental Studies at Harvard University. She previously taught at Harvard and Rutgers universities, and she is currently a Visiting Lecturer in the Department of Visual and Environmental Studies at Harvard, where she teaches Documentary Fictions and Introduction to Nonfiction Videomaking. She is a fellow at the Film Study Center and the Sensory Ethnography Lab.